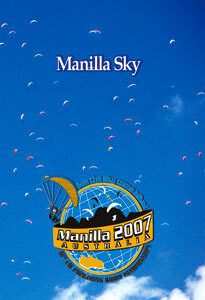 The 2007 PG Worlds held in Manilla, Australia, was one of the closest fought contests in the history of the event. Despite less than ideal weather conditions, 150 pilots did battle over six tasks culminating in a nail biting finish that saw British multiple champion and designer of Airwave paragliders, Bruce Goldsmith, crowned World Champion. This one hour and forty minute long professionally filmed documentary takes you deep into the heart of the action. 3D tracks and Google Earth landscapes are used to analyse each task blow by blow, giving you the chance to learn from the best pilots in the world who talk candidly about their decision-making processes. Stunning onboard footage and high quality in air and ground based camera work captures the highs and lows of high level competition in a way rarely seen before. Even the excitement and risk of competing at this highest echelon is portrayed with several mid airs caught on film. The entire package is set to a thumping soundtrack from a selection of great new Aussie bands to create an unforgettable experience that tells the tale of what really happened down under in the 2007 Manilla Worlds.